Taking a break from the numerous Chinese New Year fares, it was a different food affair a couple of days back at Kenny Rogers Roasters. Bond with family, friends and loved ones over a hearty meal and oriental flavours by Kenny Rogers this festive season. Kenny Rogers Roasters introduced their latest addition to the menu, the Teriyaki Chicken, an oriental twist to the usual roasters. Paper wrapped, Kenny Rogers Roasters Teriyaki Chicken comes in the form of a rather large piece of savoury chicken whole leg, marinated in a special teriyaki sauce with herbs and baked ready to serve. Now I've tried before the chinese version of paper wrapped chicken, and even though this doesn't taste the same, it has a similar concept, with all the flavours wrapped inside and locked in. Regardless of what people tell me, about how mainstream the Kenny Rogers franchise has become, I still prefer their meals as compared to the competitors. I attribute it to the softness and tenderness of the chicken thighs served, and their 'oh so nice' chicken coleslaw side dish. Coming back to the new offering, the Teriyaki Chicken, my take on it is that the teriyaki flavour is really mild, with a stronger pepper, herb taste overpowering the teriyaki taste. I still would have preferred more teriyaki sauce, as I've always been in love with those Japanese teriyaki chicken. Come one, come all, try out Kenny's Teriyaki Chicken today. 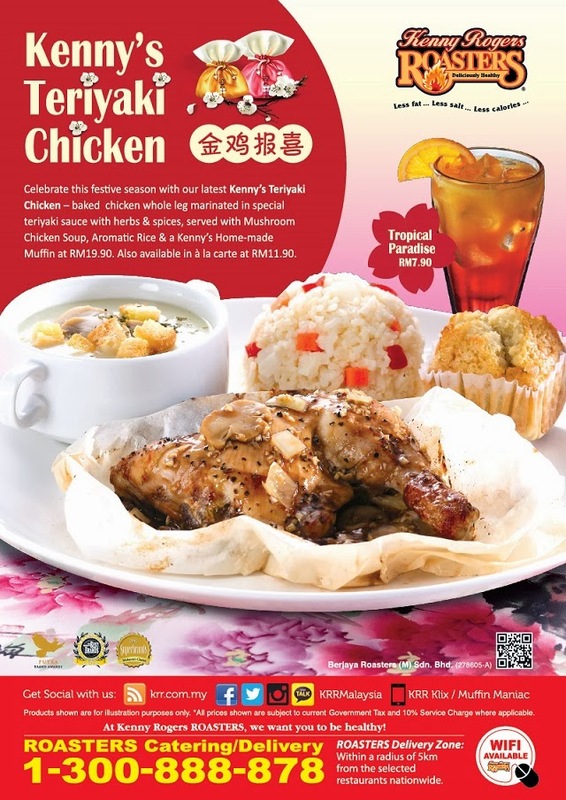 You can opt for the full serving which on top of the succulent chicken leg includes a serving of Aromatic Rice, a bowl of Mushroom Chicken Soup and to be finished off with a Kenny’s Home-made Muffin, available in various flavours including Golden Vanilla, Banana Raisin, Chocolate Raisin, Zesty Orange, Mocha Chips, and Creamy Pandan. Now I did not know Kenny Rogers has introduced so many different flavours to their muffins, and I still thought they come in 3 flavours, Vanilla, Chocolate and Banana. The Mushroom Chicken Soup wasn't really to my liking, as I felt it was a tad too starchy. It did add a bit of variety to the mostly chicken meal. Compared to other competitors' aromatic rice, I've always liked Kenny Rogers' rice as it has this really tasty savoury flavour to it, to an extent of being sweet. The aromatic rice goes really well with the coleslaw I ordered though. I do love my coleslaws. To wash it all down, we were offered a refreshing sip of Tropical Paradise, the tropical flavour mix of orange and pineapple with a splash of strawberry, specially offered to complement the flavours of the Kenny’s Teriyaki Chicken meal. It isn't included in the set by default though, which I thought isn't really right. Shouldn't drinks be included in set meals? Anyway that's just me. The drink itself is really sweet, so do ensure you stir it fully before gulping down the good stuff. As a time to catch up with friends and relatives, festivities are always celebrated with an abundance of food, so why not make it a healthy meal? Always ready to whet your appetite and fill your stomachs with balanced offerings, the KRR Take It Home Feast is back, featuring 6 à la carte pieces of Kenny’s Teriyaki Chicken; 2 bowls of Aromatic Rice; and 1 bowl each of Spicy Asian Salad, BBQ Baked Beans, Golden Corn & Carrot and Garden Pasta Salad. Enjoy a set of half dozen Kenny’s home-made muffins with choice of flavours. The Feast set also comes complete with 6 bottles of sweet and refreshing fruit juice. The delectable “Take It Home Feast” is available for ordering for a limited time from 13 January 2014 onwards. Priced at RM148.80*, the meal comes in a hearty and tasty pack recommended as a serving for 6 pax. Of course, for those who wish to find out more about the promotion can visit any Kenny Rogers Roasters restaurant or kindly contact 03 - 2119 9888. Do check out their website at www.krr.com.my or Facebook page at www.facebook.com/KRRMalaysiato know more. Japanese Occupation @ Kenny Rogers!!! As they say, if you can't beat them, join them!